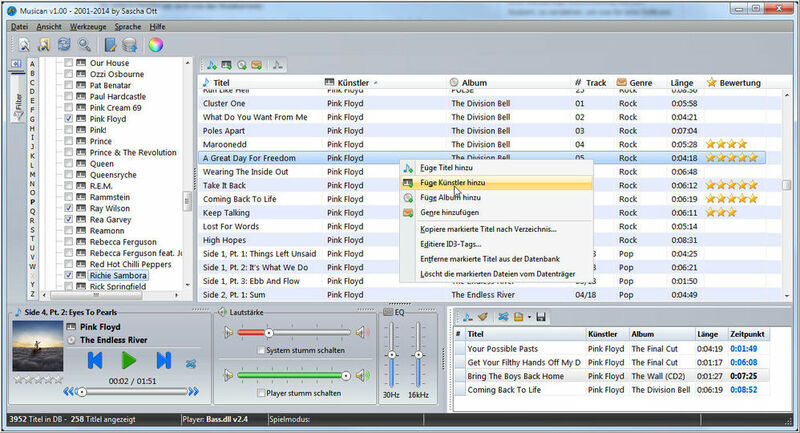 Musican is a neat free MP3 player and organizer you can use with Windows. It is designed to easily import and arrange songs, making it only a matter of a few clicks to add full albums. Your MP3-library will be presented in a central list where you can filter the content by artist, album, genre, song rating or own collections. You can map any title to an arbitrary group. A title can be a member of more than one group/Collection. As an example you have a song of Gary Moore and add this to the collection named “Great Guitar”. You can add the same song to a further collection named “Romantic”.